Las Vegas Housing Outlook: Big Home-Price Gains in 2019 and 2020? In January, realtor.com® included Las Vegas in its list of “10 Surprising Housing Markets Poised to Rule in 2019.” To come up with their list (which also included Phoenix, Miami and Boston), the group’s research team looked at the number of sales of existing homes and their prices, along with the amount of new home construction in the 100 largest metro areas in the country. Based on their analysis, the group stated that Las Vegas is one of several real estate markets where both the number of home sales and prices are expected to jump in 2019, bucking the national slowdown trend. We also forecast that the Las Vegas real estate market will outperform the nation as a whole in 2019, in terms of home-price appreciation. But there’s an important trend that was left out of this particular study. The Las Vegas housing market is indeed cooling down. There’s more inventory available today, and that will likely lead to smaller home-price gains in 2019 than what we saw in 2018. With that being said, Las Vegas is still a strong and active real estate market. And it will likely remain that way for the foreseeable future. We expect home prices in this market to rise more than the national average in 2019. Given the current supply-and-demand situation in the area, it would not be surprising to see the median home value in Las Vegas climb somewhere between 6% and 8% during 2019. Home prices in Las Vegas rose steadily over the last few years, outpacing the national average. (Of course, prices in this market declined harder and faster than the nation as a whole during the last housing crash, and that certainly plays a role in the rapid rise we are seeing today.) The difference is that the current run-up in prices is a bit more sustainable, being driven more by supply and demand instead of rampant speculation. As of January 2019, the median home value in Las Vegas was around $277,000. Home prices in Las Vegas have more than doubled from the low-water market set in 2012, but they still haven’t reached the peak set during the previous housing boom. That’s not necessarily a bad thing, either. The price peak reached back in the 2000s was the result of an unsustainable bubble. So we should hope things are different this time around. During 2018, the median home value in Las Vegas rose by around 14% according to Zillow. That was nearly double the national rate of appreciation during that same 12-month period. The chart below shows the median home value in Las Vegas over the past ten years, according to Zillow. As you can see, prices have risen steadily over the past few years. 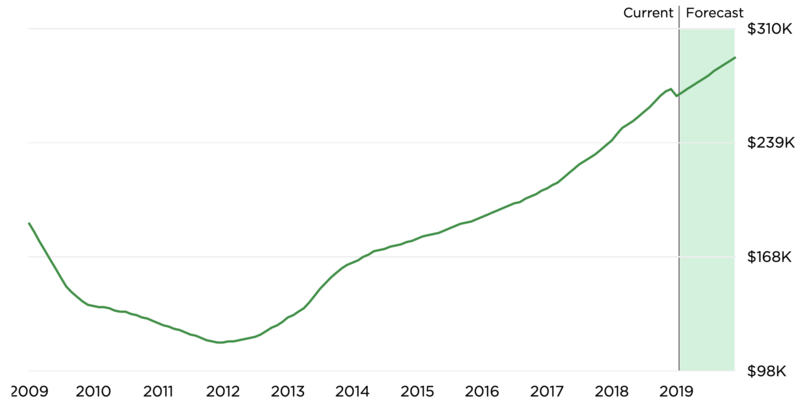 You can also see Zillow’s positive forecast for the Las Vegas housing market through 2019 (shown in the green shaded area). Chart: Las Vegas home prices over 10 years. Source: Zillow. At the end of 2018, the property analytics company CoreLogic also reported that the Las Vegas real estate market was overvalued, based on its analysis. So a slowdown in price growth might be a good thing at this point. There’s good news for home buyers who are planning to enter the Las Vegas housing market in 2019. Real estate inventory (i.e., the number of homes listed for sale) has increased over the past few months. This means that buyers who make a purchase in 2019 could have more properties to choose from — and maybe a bit less competition as well. Some forecasts suggest that housing inventory in Las Vegas could continue to grow throughout the year. Inventory in Las Vegas “bottomed out” at around 1.9 months in July. It then rebounded to around 3.7 months at the end of 2018. According to economists, a 5- or 6-month supply of homes is considered to be a “balanced” real estate market. So back in the summer of 2018, Las Vegas was looking like a seller’s market in terms of inventory. But it’s beginning to shift more toward “neutral” territory. The growth in for-sale inventory became apparent at the end of 2018. According to the Greater Las Vegas Association of REALTORS®, about 10,000 single-family homes were on the market at the end of November 2018. About 7,000 of them hadn’t had a single offer yet. That marked a 54% increase in inventory from a year earlier. The bottom line to all of this is that there were more homes listed for sale at the start of 2019 than there were during 2017 and (most of) 2018. You can’t talk about Las Vegas housing market forecasts and trends without looking at the population. It’s an important factor on the demand side of the equation. And the population in Las Vegas can be summed up with two words: gradual growth. The state of Nevada’s population rose above 3 million last year. In December, The U.S. Census Bureau reported that Nevada’s population increased by almost 62,000 people (or about 2.1 percent) between July 2017 and July 2018. In Las Vegas itself, the population was around 631,676 in 2018. That was about 10% higher than in 2010. So there has been steady growth in Las Vegas, as well as in the state of Nevada as a whole. This kind of trend increases demand for housing, on both the rental and purchase side. It also helps to sustain home prices over time. Employment is another important consideration for home buyers. This is true for investors as well as “regular” buyers who plan to occupy the homes they purchase. In short, a strong local job market gives buyers the financial means to purchase a home, and to keep up with their mortgage payments. And there’s good news here as well. While Las Vegas’s unemployment rate is still higher than the national average (as of January 2019), it has improved steadily since the post-recession years. The chart below is based on data provided by the U.S. Bureau of Labor Statistics. The gray shaded area that starts around 2008 indicates the country’s recession. As you can see, the unemployment rate in the Las Vegas-Henderson-Paradise metro area skyrocketed from 2009 to 2010. But starting in 2011, it began to steadily decline as the local economy gained jobs. Disclaimers: This article contains housing market forecasts and predictions for the Las Vegas real estate market through 2019 and into 2020. Such predictions are the equivalent of an educated guess and should not be considered financial advice.